All of the information and materials contained on the entire Pancreatica.org Internet website are intended for general medical and health information and educational purposes only, and are not in any way intended to be used as a substitute for professional medical advice, treatment or care. To the contrary, persons who visit this site are encouraged to discuss any and all of this information with their own physicians. The use of this website does not create a physician-patient relationship between Pancreatica.org and the user of the site, and in no way obligates Pancreatica.org to any follow-up or contact of any and/or all users of this Pancreatica.org website for any reason including, but not limited to, medical or health reasons. Persons who visit this Pancreatica.org site should in no way rely on any information provided on this site for their own health needs. All specific medical questions which arise as a result of viewing information on this site should be presented to your own physician for review. The philosophy of this site encourages strong bonds between patients and their own doctors. Pancreatica.org makes no guarantees, warranties or representations, implied or express, as to the appropriateness, timeliness, accuracy, completeness, and/or usefulness of any of the information, opinions, advice, services, data or other information contained or referenced on this website. There may be mistakes in the information presented. Pancreatica.org assumes no risk or obligation for your use of this website. 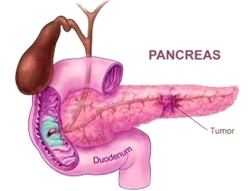 Persons who visit and use this site are hereby advised and need to be fully aware that there are many controversies in the research, diagnosis, treatment and care of cancer and of cancer of the pancreas. Further, information and understanding about cancer and many related medical topics are in a constant state of change. As the Pancreatica.org website is only updated on a periodic basis, the site may not contain the most recent medical information. Pancreatica.org reserves the right to update or change information contained on this website at any time. Further, Pancreatica.org is not responsible for the content of information appearing via hyperlink to other Internet sites. Pancreatica.org does not endorse any other Internet site, nor does it vouch for any information which may be contained on any other Internet site, including those to which it provides Internet links. Pancreatica.org is not a provider of cancer care. It does not profess to be an expert in these matters. This website does not recommend any specific individual course of treatment or clinical trial. Treatments and clinical trials are listed in an arbitrary or random order. Clinical trials occurring in other countries, may not be approved by the U.S. FDA and may not meet the standards of the FDA. Any papers or other information which are written for the site by principals to the site and/or by the information services arm of Pancreatica.org, are intended for educational purposes only, and are intended to help visitors round out their understanding of some of the complexities and difficulties involved in the research, diagnosis, treatment and care of patients with pancreatic cancer. These writings may contain information that is outdated, lacks context, is inaccurate or is misleading, and thus these writings should not be relied upon for any reason. The bibliography – links related to treatments, clinical trials, and other issues may or may not be from peer-reviewed medical journals, are provided for informational purposes only, may overstate the results of the value of the trial, may lack context, may be inaccurate, may be outdated, and thus they should not be relied upon for any reason. Despite receiving grant funds from foundation sources and drug industry companies, Pancreatica.org endeavors to maintain a strict policy of neutrality in regard to these supporters. Although the support logos may be on display in the appropriate sections of the Pancreatica.org site, this feature does not represent an endorsement of such firms or of their drug agents or other products. Credibility is an invaluable mainstay of a content site such as Pancreatica.org, and serious effort is expended by the staff to offer unbiased mainstream medical information to viewers, within the context of the presentation of a full range of options. The Pancreatic medical literature section should not be relied upon as it consists of abstracted or full information from wire-service press releases, company press releases, news articles, medical journal abstracts and medical abstracts which, among other possible problems, may represent a poor sampling of contemporaneous information, may slant the information due to truncation or skewing secondary to the abstracting process, may require a higher level of expertise than the staff of pancreatica.org possesses in order to screen and interpret and express such information properly, and may rely upon releases and articles which are misleading or false AND thus may give misleading or false information, may come from self-interested parties, may not be timely, may present misleading headlines AND may present false or incomplete research and/or research results. The Abstracts section should not be relied upon as they consist of abstracted (or full) information from wire-service press releases, company press releases, news articles, medical journal abstracts and medical abstracts which, among other possible problems, may represent a poor sampling of contemporaneous information, may slant the information due to truncation or skewing secondary to the abstracting process, may require a higher level of expertise than the staff of pancreatica.org possesses in order to screen, select and interpret and express such information properly, and may rely upon releases and articles which are misleading or false AND thus may give misleading or false information, may come from self-interested parties, may not be timely, may present misleading headlines AND may present false or incomplete research and/or research results. The Links section should not be relied upon as they consist of links to sites which may contain false, incomplete, misleading or dated information. Further the highlighting of such selected Internet websites (and even the description of the sites themselves) may be misleading as this highlighting process may tend to slant medical information, may involve self-interested parties and/or may require a higher level of expertise than the staff of Pancreatica.org possesses in order to properly fully evaluate and present such sites, and to describe them in correct context. Pancreatica.org does not certify the accuracy, appropriateness, completeness, or currency of any books or other publications which may be highlighted on the Pancreatica site. Any such books or other publications may contain wrong and inappropriate information. They are placed on the page by way of informing the public about the existence of such works; and in some cases Pancreatica.org may receive a publisher’s discount rebate from the sale of a book or other publication from the site. Such books or other publications should additionally not be relied upon as their selection or even description may require a higher level of expertise than the staff of pancreatica.org possesses in order to fully evaluate or express properly. In consideration for your use of and access to this Pancreatica.org website, you agree that in no event will Pancreatica.org or any other party or person involved in creating, producing or delivering this website (including any and/or all of its contents) or any site linked to this website, be liable to you in any manner whatsoever for any decision made or action or non-action taken by you in reliance upon the information provided through this Pancreatica.org Internet website and/or its links. Please send notice of any mistakes, other corrections, additions, suggestions, and/or information on other clinical trials to info@pancreatica.org.